Pro Pitchers' Dirty Secret Rubbed On Every Ball Without a little mud, pitchers in the pro leagues wouldn't be able to put enough topspin on their pitches. It can't be just any mud, either. Since the 1950s, all the mud in every major league clubhouse has come from the same secret spot. Lena Blackburne Baseball is the only baseball rubbing mud company that serves the pro leagues. Where does the mud come from? That's a secret. Dan O'Rourke shows how to get new balls dirty. Behind every pitch in professional ball is a guy like Dan O'Rourke, rubbing up baseballs in the Philadelphia Phillies clubhouse. He plucks a ball from a stack of boxes between his knees and prepares his hands with mud. "I'm applying mud to the baseball to take the sheen, the shininess off the ball, so the pitchers have something to hold onto," he says. He gives the ball a few quick turns against his palm. "I do roughly three to four balls at a time," he says. 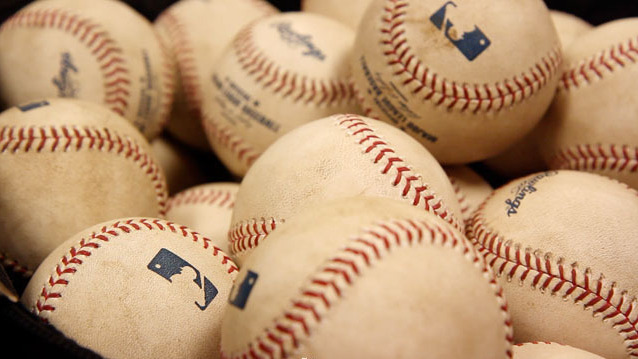 Rubbing new balls with mud is standard practice for every clubhouse in Major League Baseball, and since the 1950s, all that mud has come from the same secret spot in southern New Jersey. "I guess you'd call me a mud farmer," says Jim Bintliff, president of Lena Blackburne Baseball Rubbing Mud. That's right, baseball rubbing mud. Bintliff's is the only baseball rubbing mud company that serves professional baseball. Bintliff does his harvesting in shallow water on a muddy bank of a Delaware River tributary. He shovels the top inch or so of mud off the surface, where it's the smoothest. "It's the texture; it's like a cold cream," he says. "If it's too gritty, it can damage the leather on the ball." Legend has it players started rubbing up baseballs after an errant pitch killed a batter back in the '20s. Umpires tried tobacco juice and infield dirt to rough up the new leather. Turned out what worked best was mud drawn from the favorite fishing spot of a friend of Bintliff's grandfather. That mud is now the standard in professional leagues. "There are times that an umpire will throw me a ball, and I'll just throw it right back to him ... because it's either not rubbed up enough or too much," says Mike Koplove, who pitched for the Arizona Diamondbacks, the Cleveland Indians and other teams. Koplove says a brand-new ball feels almost like a cue ball. One that's rubbed up has a bit of texture, which is especially important for curveballs and sliders. "You have to use your fingers to impart a really tight topspin or a side spin on the ball, and if your fingers just kind of slide right off, the ball's not going to curve as sharp or as hard," he says. Bintliff says harvesting, filtering and packaging the famous mud is hard work, but it's worth it. "It doesn't take long to think, 'This mud was on baseballs that are in the Hall of Fame,' " he says. "It's kind of a neat connection." It's a connection most fans won't even notice as slightly dirty baseballs fly off the pitcher's mound. But Bintliff, he'll know his mud was there.